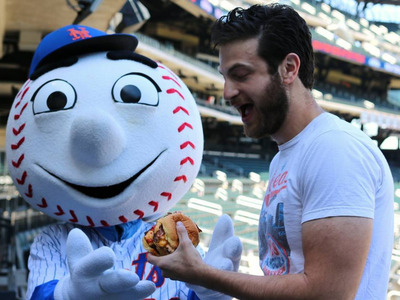 brunchboys / InstagramJacobowitz enjoying a burger at Citi Field. Jeremy Jacobowitz is a full-time food Instagrammer. He’s the guy behind @brunchboys, an account that has close to 200,000 followers. Jacobowitz is a born and bred New Yorker who manages to make a living in one of the most expensive cities in the world by taking drool-worthy photos of his over-the-top meals. After starting off in food TV — Jacobowitz was Bobby Flay’s assistant for two years, and then he moved into production — his Instagram account has become his bread and butter. He takes advantage of the free food restaurants offer him. Jacobowitz says he would never charge a restaurant to be featured in one of his Instagrams, but he does willingly accept the free food they provide him with when he stops in to photograph. “Why would I even bother ruining relationships with restaurants for a couple hundred bucks? That’s so silly. They’re giving me free food,” Jacobowitz explains. He does sponsored posts on his Instagram account. Although Jacobowitz refuses to charge restaurants, he doesn’t shy away from asking for money when he features a brand or large restaurant chain on his account. His first question to a brand is if they have a budget, and then he usually negotiates from there. Below is a sponsored post Jacobowitz did for the dating app Bumble. Jacobowitz wouldn’t reveal how much he makes from sponsored posts, mostly because the number is constantly changing thanks to the fact that his account grows about 900 followers a day. But he did say that he can get by on six sponsored posts per month. He gets paid in other ways than cash. Along with the free food Jacobowitz receives from restaurants, he gets paid in other ways that make life easier. For example, Uber pays him in credits that he can use towards both actual rides and UberEATS. He lives a frugal lifestyle. Jacobowitz admits that he doesn’t need all that much to make a living. He describes himself as being “very cheap” and says that he’s used to not spending much and not knowing how much he’ll be making thanks to years of freelancing when he worked in TV.